There is always a moment when everything turns. I remember one afternoon, hiking the West Highland Way in Scotland with a group of my first-year students. The weather was very bad. The wind was strong and the rain got in every fold of our clothing. The rain turned to snow. Those of us with walking sticks used them to brace our steps when we crossed moving water. No one was saying very much. It was, in other words, a fantastic day. One student walked up next to me and matched my pace. She smiled at me. She was completely uncomfortable and completely happy. I smiled back at her. Then she picked up her pace to rejoin some classmates. I love moments like that. At Concordia College we have a program for first year students we call the Inquiry Seminars. While the program, broadly speaking, has a shared set of goals, every individual section of the course is designed around a professor’s particular interests or passion. Mine is travel writing, the pursuit of adventure, and putting students’ feet in contact with the ground they’re reading about. Sometimes that ground is soil, sometimes it’s water, sometimes it’s imagination. The purpose of the Inquiry Seminar is to introduce you to the world of scholarship through an intensive, collaborative investigation of a specific, innovative topic. In this course you will be asked to engage difficult questions and complicated issues using multiple approaches, and will learn to think critically by addressing important problems, questions, theories and concepts. You will also seek insight through scholarly inquiry and careful examination of a variety of opinions, assumptions, and convictions. Finally, you will learn how to gather, explore, and evaluate information in order to produce clear, reasoned arguments and ideas. In short, you will develop skills and intellectual capacities that will serve you well throughout your entire life. Critical Inquiry: In the context of this course, critical inquiry involves gathering, exploring, and evaluating information, ideas, and assumptions in order to produce clear and reasoned analysis, understanding, and wisdom. As with all courses at this college, we are actively engaged in supporting the mission of the college and upholding the five Goals for Liberal Learning. This coming semester, we have Inquiry Seminars that range from Samurai Warriors of Japan to the Philosophy of Humor & Comedy, from Tolkien’s Ring of Power to Mysticism in Music and Literature to Gender Equity and the World of Sport. My own, which comes from a life-long love of adventure stories and my own work as a travel writer, is called Adventure, Exploration & Risk. Adventure, Exploration & Risk is a large-workload class. In the fifteen week semester we will read nine books (all nonfiction), watch five documentary films and three multi-part documentary television series. The students have a reading/watching response essay due every Monday. They write a fifteen page research essay, due just before Thanksgiving, and 50% of their grade is class participation. It’s no class for the quiet or the procrastinators. It is also no class for the dogmatic, the arrogant, the vain or the unquestioning. This is a class where large questions leap out of every page. What are our moral obligations to others when our own life is in peril? What is the appeal of any limit, edge, boundary? Does personal adventure and exploration have any cultural or social value? What is your life worth? Is riding a rocket, flying an airplane, diving into a shipwreck worth your life? What values and base-assumptions from our own culture and background to we carry into foreign places? How do we deal with those? What is the need for local knowledge? This is a class where large questions leap out of every page. One of the ways to approach large questions is by comparison, so one of the operating assumptions of the class is that every book, article and movie we cover is always on the table. We do not close conversation on book one when we begin book two. At the end of the semester, when we’re reading the last book, having also viewed a half dozen movies and ventured into the field as often as we can, the discussion ranges all over the place. Is there a connection between Saint-Exupery’s Wind, Sand and Stars and the movie 180 Degrees South? Why yes, there is. Is there any connection between Jon Krakauer’s climbing Everest and Peter Matthiessen’s wandering about the Himalayas looking for a Snow Leopard? Why yes, but it may not be what you’re thinking. I do not approach the texts in this class the way a stereotypic literature class would: I am, first and foremost, a writer. I do not provide cultural context or author biographies. What I do, instead, is ask a group of 18 or 19 year olds to dive into the text. This is very much a close reading class. Every day is filled with chapter and verse. What issues do you see? Find me a quote. You want to talk about a situation or idea? What page? Let’s start there and then work outward to see what else we can include. I will always drop into the conversation what I consider to be focusing questions or avenues of thought I hope will lead the students to deeper insight. And I do explain, briefly, concepts or contexts that help clarify. (For example, Romanticism and Colonialism and Buddhist thought often need a bit of definition.) But students are encouraged to bring in the whole of their life experience so far, as well as every bit of reading they have done in other courses or on their own. You read Hatchet in sixth grade? Great, tell me more. The idea is that learning, and values and experience are whole-life projects. If a student has traveled, that’s wonderful. If a student has not, that’s a depth of local cultural knowledge that fits in well. If reading or experience sparks a question, full speed to discovery. The whole notion of the class is really about bringing Self to Text and Text to Self. It’s a dynamic conversation. One of the hallmarks of the class is the experiential learning. For every book (or at least every large theme), I try to provide a field experience. Because they all cost money, none of them are required. But when we are reading about the oceans, (for example, Perfect Storm or The Proving Ground or Shadow Divers) we go sailing on a local lake. When we are reading about flying (for example, Wind, Sand and Stars or West With The Night or Fly By Wire), we head to the local flight school where every student has the chance to pilot a single engine airplane for an hour (with an instructor, of course). We go scuba diving in the college pool. We eat strange food at a local restaurant. All of these experiences make the book-learning physical and muscle-real. It changes the way we judge what we read. Not so much the literary quality as the experience itself. The main experiential event of my class is a week-long mid-semester hike—our college calls them Exploration Seminars—on the West Highland Way in Scotland. 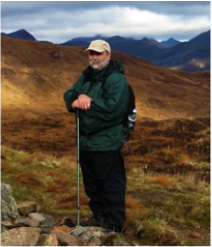 The West Highland Way is a perfect hike for students, many of whom do not have serious or deep wilderness experience. The trail is nearly 100 miles long, and yet every night is at a local Bed and Breakfast. A van carries our luggage from one evening’s rest to the next so all we have to hike with is a daypack with water, weather clothes, and a camera. The trail has its challenges. Scotland weather, in October (we go during our fall break) is often terrible. The hills can be soul-crushing. And while every day ends in a nice place, the trail does not provide many exits in places and often the only way out is to keep going. I tell the students that the topic of the hike is not Scottish culture or history (though they certainly get a lot of that while there from talking with locals). The topic is self-discovery. Who are they on this trail? How do they handle the challenge? How does who they are fit (or not) with where they are? My work is to point the way toward wonder. The trail tests every student. They bring back stories of exhaustion and joy. They bring back stories of late night learning to play the bagpipe. They find community with other trail-walkers they see every day. They bring back stories of hobbling blisters and deep amazement at the shape of the earth. What I hope the class achieves is a way to think about learning, what happens when we specifically incorporate experience into the world of books and reading and writing. The men and women who work on the large hadron collider are as much explorers and adventurers as the early astronauts. Personal quests are within all of us, and they fill every corner of who we are. Everything counts. When a student makes a connection between this week’s reading, personal history, new experience, and an evolving sense of responsible engagement with the world, the class is alive. Sometimes the class is permanent. When an avalanche ripped through Everest Base Camp this year, there were students at my office door. They wanted to talk. They wanted to share the questions, practical and moral and personal, that were in their heads. The class is not offered in the spring semester, so not one of the students who stopped by, and who kept stopping by, was after a grade. They were after something that mattered. Click here for Adventure, Exploration and Risk syllabus. W. Scott Olsen is a writer, photographer and professor of English at Concordia College, Moorhead, MN. The author of eleven books, editor of several anthologies, and editor of the national literary magazine, Ascent, Olsen has published individual essays, articles, and stories in a number of literary publications including Alaska Quarterly Review, Albany Review, Huffington Post, Kansas Quarterly, Kenyon Review, Mid-American Review, North American Review, North Dakota Quarterly, Northwest Review, Red River Journal, River Teeth, South Dakota Review, Tampa Review, Third Coast, Weber Studies, Willow Springs and others as well as commercial publications in magazines such as The Forum, Flying Magazine, AOPA Pilot, Flight Training and others. His new book, A Moment with Strangers, will appear in March of 2016.